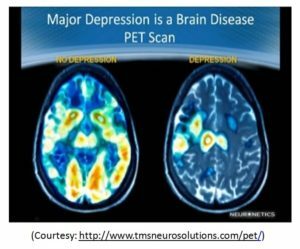 “Suppression of depression is not good. Expression is always good. If depressed, share your feelings with others, it will make you feel better,” was PM Modi’s address to the nation prior to World Health Day. The passing of the Mental healthcare Bill along with the PM’s declaration are positive steps towards reducing taboo around mental health. However even if you cross that first barrier and accept that you have an emotional problem and are ready to take help you may still wonder…am I receiving the right treatment at all? Many people believe that visiting a counselor will solve their problems, but unless the person you are meeting is managing your illness effectively, you are unlikely to show much change. One needs to meet an accredited and trained psycho-therapist (not a “counsellor”), someone who will actively work to alleviate your symptoms. Therapy is hard work. It is not just about “Talking and Listening”. You will need to work within and between sessions to change your activity level, daily schedule, mood, thinking and social relationships.That doesn’t mean you need to work on your own. Your therapist work with you through the negative thinking patterns that reduce your motivation to make these changes. In the first session your therapist will usually administer a brief screening tool for depression such as the BDI(Beck’s Depression Inventory). Your therapist needs to assess if you meet the current diagnostic criteria for major depression (diagnosticcriteria are a set of indicators which classify if a person is suffering a particular illness). Major depressive disorder typically includes a set of symptoms a person needs to be feeling almost EVERYDAY for atleast 2 weeks. I think I could have managed all this through google search… So what’s next? Your therapist will then check your activity and daily schedule. Most people with depression spend their day doing little or no productive activity. Some people with depression may be able to sustain regular routine, but may not be able to do things that give them a sense of accomplishment or pleasure. 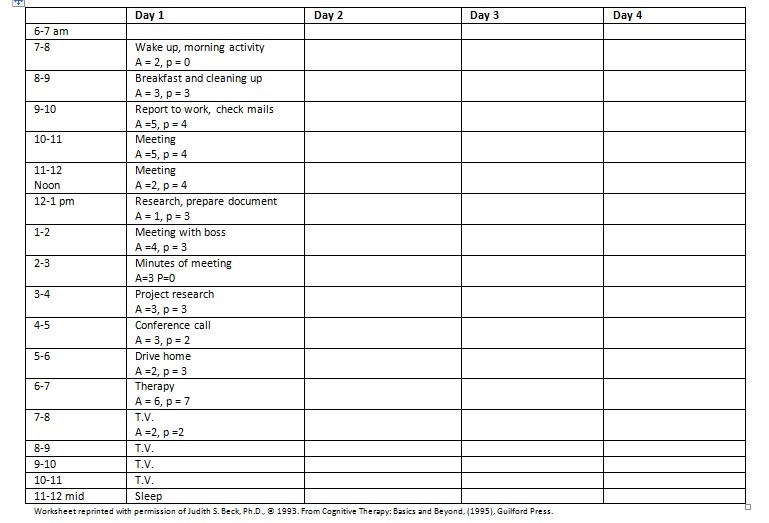 You will record activities in a similar chartduring a typical week and monitor your schedule along with your therapist. You will also rate on a scale of 0-10 (0=None, 10=Highest) level of Accomplishment or Pleasure you experienced when doing the activity. You will then discuss with your therapist to add activities that can give you a higher sense of pleasure and accomplishment. Reading a novel by favourite author. Okay, this seemed easy. Now what happens next? Maintaining the activity log, then discussing activities and finally completing those activities is easier said than done. Negative thinking is the biggest challenge that a person with depression needs to work with. Imagine a cardoing a 100 mile journey on ¼ filled fuel tank. It will reach reserve fuel in no time. A depressed mind is exactly like that.The person tries his or her best todo certain activities but negative thinking is that empty fuel tank, it usually doesn’t allow one to go too far. 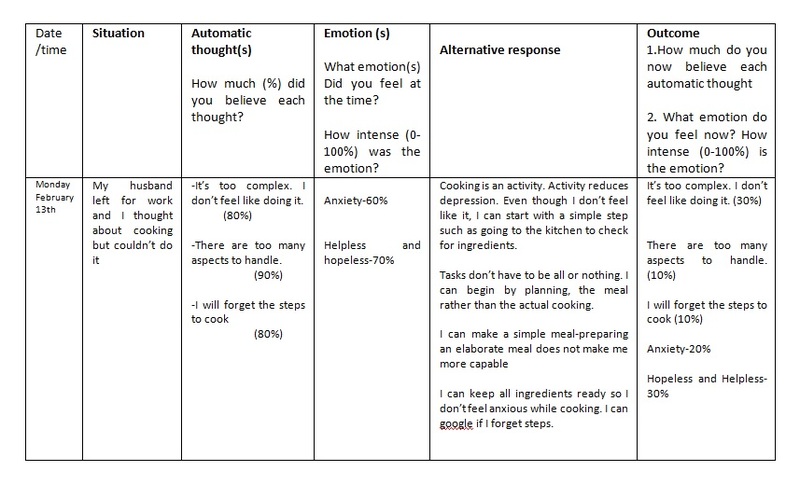 So now your therapist will introduce to you the concept of monitoring your thoughts…a concept called Cognitive Restructuring based on the Cognitive model. 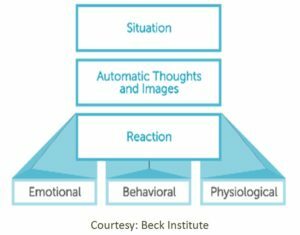 The cognitive model suggests that how we perceive a situation influences our emotional, behavioral (and often physiological) reactions. Our perceptions are often distorted when we are distressed. 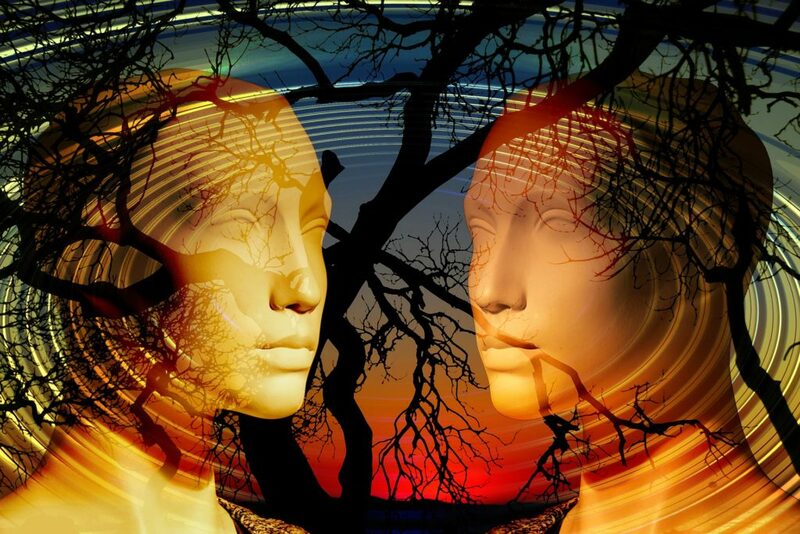 In therapy, you will learn to identify and evaluate “automatic thoughts” (spontaneously occurring verbal or imaginal cognitions), and to correct your thinking so that it more closely resembles reality. Evaluating Automatic thoughts usually decreases emotional upsetness and increases the likelihood of behaving more functionally. Once you start monitoring and evaluating your thoughts, slowly you will see your mood improve. At the start of each session your therapist will also do a Mood check by asking you “On a scale of 0-10 how would you rate your mood today?” If your mood has dipped significantly from the last session you will evaluate why and assess the situation and negative thoughts. In a few weeks, you may see significant improvement in your mood. You may start feeling like you earlier self and return to many of the activities you had stopped doing. You will also use the above thought record sheet and other tools to start modifying your more persistent and underlying core beliefs (the “root” of your depressed thinking). Eg: (“Ï am worthless, unlovable, failure). Your therapist may also ask you if you would like more comprehensive treatment which involves working on adverse childhood experiences using a form of therapy called EMDR (Eye Movement Desensitization and Reprocessing). EMDR addresses early traumatic experiences that may have led to the developmentof the current depressive symptoms. Therapy will continue for about 12-15 sessions. You will continue to monitor daily activity, mood and distorted thinking patterns. You may meet your therapist for follow-up sessions once a month to reduce chances of a relapse. The good news is that you will have learnt skills by now that help you identify your triggers for depression and learnt skills and techniques to improve your mood. Now that you what therapy is about….what’s stopping you? H’vovi Bhagwagar is a Clinical Psychologist and trauma therapist, with over 17 years of experience as a psychotherapist, mental health trainer, motivational speaker and researcher. Hvovi operates her clinic “MANASHNI” at Powai, Mumbai. She also consults with Dr. Reddy’s, Oberoi International school and is a panel expert with Bipolar India and RobinAge Newspapers. Hvovi works with clients diagnosed with mood disorders, personality disorders, phobias, panic attacks and bipolar disorder. Hvovi is the first Indian to publish a case study in an International Journal on anxiety disorders using trauma therapy. She is one of the few Indian psychologists who is trained in treating rare cases of complex trauma such as Dissociative identity Disorder.